Central Bank of India Recruitment 2018-19: Apply Online for one FLC Counsellor vacancy in Central Bank of India recruitment 2018 in Chhindwara. 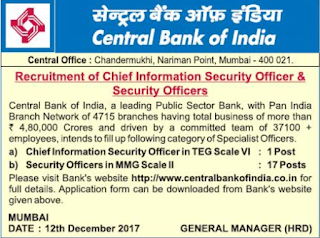 New recruitment Jobs 2018 notification published for the post Chief Information Security Officer inCentral Bank of India recruitment 2018read complete details before applying. One Vacancy in Central Bank of India for the post Director. 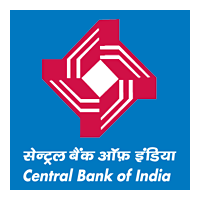 Central Bank of India Recruitment 2018 Job alert both Fresher and Experienced can get Central Bank of India recruitment 2018 updated on December 14, 2017 notification on recent Central Bank of India recruitment 2018 openings across India. This is an exclusive page updated on 14.12.2017 for the latest recruitment notification from Central Bank of India 2018 it contains both active and recently expired Job openings and recruitment notification from Central Bank of India 2018. Central Bank of India has published Advertisement for below mentioned Posts 2018. Other details like age limit, educational qualification, selection process, application fee and how to apply are given below. Desirable: Officers with rural development background i.e. Agriculture Finance Officer / Rural Development Officer / Agriculture Officers converted to Mainstream banking / Lead District Managers and Faculty leaders / Faculty members of Training Centers / Colleges with specialization in Rural Development etc. shall be preferred. years of service of which at least 15 years in Officer Cadre. OR as AFO (Agriculture Finance Officer) in a Rural Branch for a period of 3 years. Address to sent Applications: Regional Manager, Central Bank of India, Regional Office-Ambikapur, Dhanjal Complex, RingRoad, Nemnakala, Ambikapur, Pin-497001. Central Bank of India has published Advertisement for below mentioned Posts 2017. Other details like age limit, educational qualification, selection process, application fee and how to apply are given below. Management Group (MMG), Scale II (Specialist Category). Apply before 22 December 2017. Qualification/ eligibility Conditions, how to apply & other rules are given below…. Educational Qualification : Degree in any discipline from a recognized university or any equivalent qualification recognized as such by the Central Government and Ex-Commissioned Officers of the Rank of Captain or above from Indian Army with minimum 5 years’ service or equivalent rank from Air Force, Navy and Para Military Forces. Central Bank Selection Process : Selection will be based on-line test and interview. Application Fee : SC/ST candidates have to pay Rs.50/- and Rs.550/- for all Others through Debit Cards (RuPay/Visa/MasterCard/Maestro), Credit Cards, Internet Banking, IMPS, Cash Cards/ Mobile Wallets by providing information as asked on the screen. How to Apply Central Bank Vacancy : Interested Candidates may apply Online through https://www.centralbankofindia.co.in 15.12.2017 to 01.01.2018.